The cemetery might be the last place you would expect to find new life in Princeton, but that's exactly where it is. New life has been planted and an old tree supplanted, as the tradition of the Princeton Elm tree continues near the corner of Wiggins and Witherspoon Streets. In April, when the Princeton Cemetery's stately 278-year-old American elm tree finally succumbed to a long, slow bout with Dutch Elm Disease  an affliction that has wiped out nearly 77 million elms since it first struck in the early 1930s  the loss was comparable to the loss of another beloved, historic tree: the Mercer Oak. Now, like the great oak, the Princeton elm has been replaced by its own offspring. 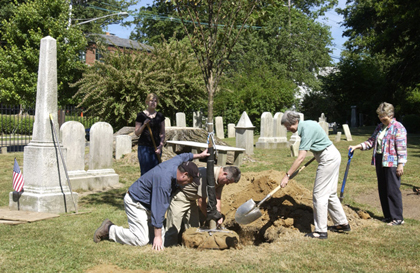 Last Thursday, just a few feet from the old elm's stump, a three-year-old sapling was planted to commemorate the history of the cemetery, Witherspoon Street, and the town. "It's special because it's an offspring of the tree, and it's a link to the other elms throughout the country," said Vicky Bergman, of Leabrook Lane. Ms. Bergman, who is also running for Township Committee, pointed out that the old tree had been host to history that preceded most of what is on Witherspoon Street now. "I wish I knew what life was like in Princeton 300 years ago. That tree was a sapling then and it would be interesting to see how the town developed." Of course the Princeton Elm, is special because it has a resiliency to Dutch Elm Disease that other elms do not have. William Flemer Jr., of Princeton Nurseries did not know this in 1920 when he planted seeds from the cemetery tree that ultimately grew into the elms that now line Washington Road between U.S. 1 and the Washington Road Bridge. Those trees would go on to survive the plague of the elm bark beetle, and so when the Princeton area was hit, it was clear that these were not just garden variety elms. Princeton Elms can be found in New York City, as well as among a line of 88 recently-planted saplings near the White House, all planted because of their ability to resist the disease. Roger Holloway, who grows Princeton Elms at his Atlanta nursery, Riveredge Farms, said replanting trees such as the Princeton Elm has more than just a sentimental benefit, however. "It's very important, especially considering all the foreign diseases coming in affecting trees," he said, mentioning Sudden Oak Death disease, the Asian Longhorn beetle, and the Emerald Ash Borer as all having contributed to the demise of millions of trees. This is why, Mr. Holloway said, resistant strains of trees need to be identified and propagated. "The point is, you can't give up  all these diseases came from outside North America as foreign invaders and there's no immunity, so it's important that we plant the right trees and keep replacing them." Such is the ideology behind the Washington Road Elms Preservation Trust (WREPT), which is working on a long-range preservation plan by identifying and possibly removing some of the susceptible trees and replacing them with Princeton Elms. "We're hoping the public will support us on that," said Jean Mahoney, WREPT board member. The organization was formed during the deliberations about a design for the former Millstone Bypass. Until the state's Department of Transportation had released its Draft Environmental Impact Statement last year, one of the proposals would have demolished many of those trees. The line of elms along Washington Road was placed on the New Jersey and National Register of Historic Places in 1998. "We want the public to be aware of the importance of the street; it's an entryway for both West Windsor and Princeton," she said. The old elm saw Witherspoon Street as a dirt road when General George Washington used to travel into Princeton and it was witness to the building of Princeton's new library. The old elm  and the stump tells the story  has also essentially uprooted the tombstone of Vice President Aaron Burr. The new elm will be witness to the renewal and expansion of another downtown institution  The Arts Council of Princeton  and should be around to see the story of Princeton for the next 300 years, Mr. Holloway said: "The American Elm is basically our national tree, and the Princeton American Elm is our first, best hope of restoring the lost heritage of the American Elm."